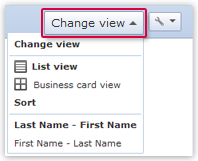 You can define the view of your contacts and select between list view or business card view. Also, if they have to be shown as single contacts or groups. You can define which contacts or groups are shown in the list view and how they are shown. The Filter buttons above the contact list allow you to define which contacts or groups are to be shown. All: All contacts and groups are shown. This is the default setting. Groups: Instead of the contact list, a list of your groups is shown. Favorites: Only entries you marked as a favorite are shown. Birthdays: Only contacts whose birthdays you entered are shown. This filter allows you to create a complete birthday list for your contacts quickly and simply. The Change view menu (top right) allows you to define how contacts in the contact list are to be shown. List view: The contacts are shown as an easy-to-read list. Besides the name, the default e-mail address is shown. Business card view: Every contact is shown as a virtual business card. This view can be clearer if only a few contacts are shown. Any profile pictures available for your contacts are shown. Choose First Name - Last Name or Last Name - First Name to set the sort order of the current view.